The elevation profile I carried with me marked with aid station locations. Blue (water only), orange (crew), and green (drop bags). Training and race preparation went well. My good friends Alina and Jen were joining me to crew and pace. I wanted to make sure their job was as easy as possible by being as organized as possible so we had a couple of working crew meetings. I had crew sheets and maps in a folder we started calling “the bible”. I bundled items in labeled crew kits. For myself, I was packed a week before the race. Where I had been a complete wreck before Squamish, now I was calm, cool, and collected for Pine to Palm. The team was ready. I wanted to go to my proving ground and even seeing the triple digit heat forecast for the weekend did not deter me. 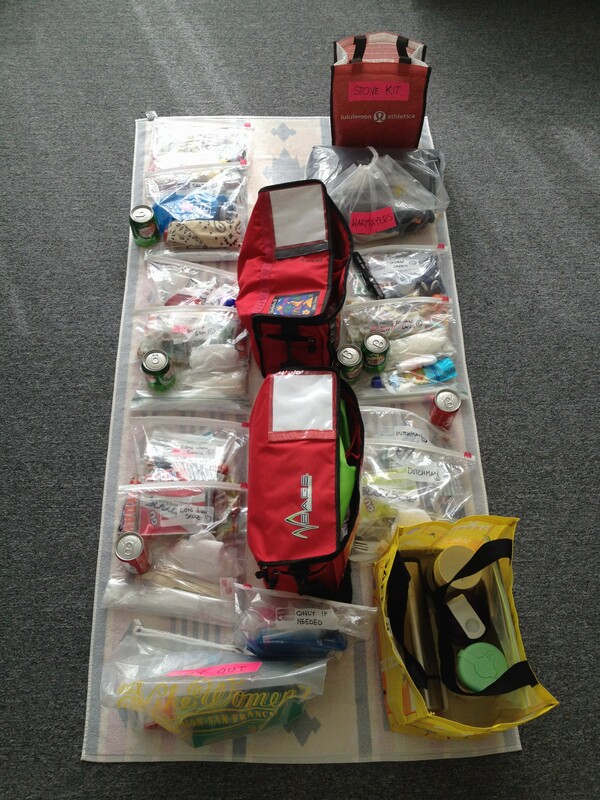 Gear for five crew accessible aid stations and two drop bag only aid stations. The race started off on a good note. Alina had driven me to the start to let Jen continue sleeping since she would be pacing me around 1 – 2 am. I had Alina drop me off and immediately sent her back to the hotel so she could also get more sleep. A long day was ahead for them as well. It was still dark before our 6am start and I was standing by myself. “Who is that?” I had turned off my headlamp to conserve the battery so all I heard was a disembodied voice. What a pleasant surprise to see her again after running into her at Squamish a few weeks ago. This time she was crewing a friend who was running the race. It was a nice distraction to talk to her. 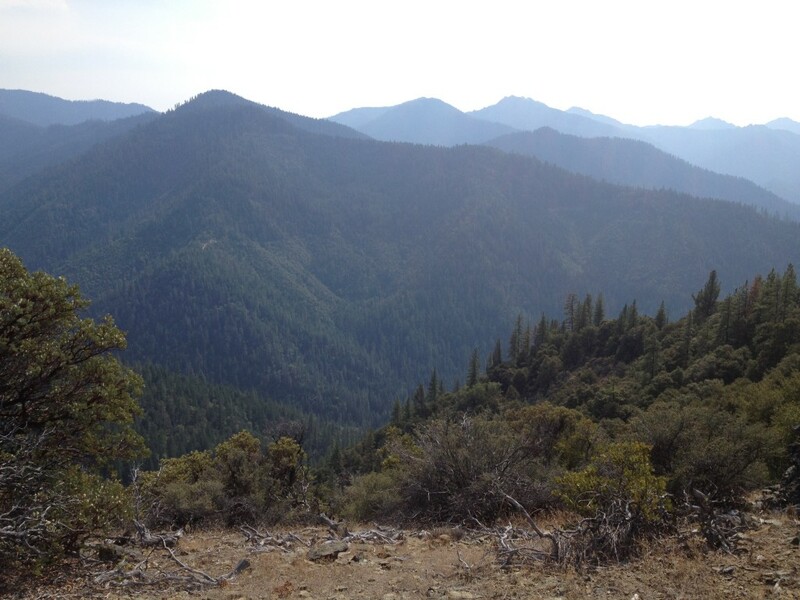 Finally the gun went off and almost immediately I was left alone in the back, everyone power hiking up the road on the 10 mile climb to Grayback Mountain. It was hard to see everyone go like that. 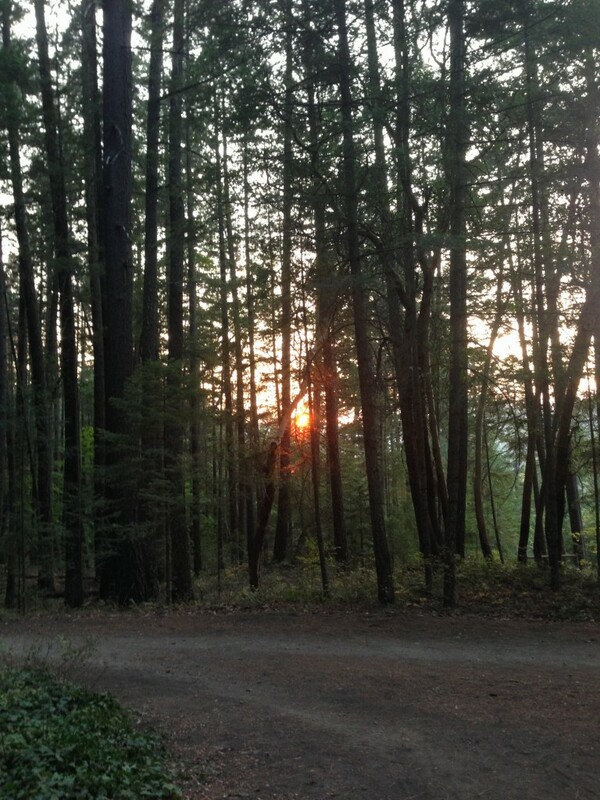 I ignored the feeling and settled into what was, for me, a sustainable effort. About 7 miles in I heard footsteps behind me. It was a guy in a red shirt and another in blue. I had passed Red Shirt (Henrik from Denmark) on a brief downhill section earlier. I stepped aside to let them both pass. I have never in my entire racing life had a sweep trailing me. No, I’m not okay. THIS is not okay. We got to a ridge line where the trail leveled off and I was able to run and pass Henrik again but that was short-lived as the trail pitched upwards. It wasn’t long before the sweep was behind me once more. He was very nice, very encouraging but it was also unnerving. 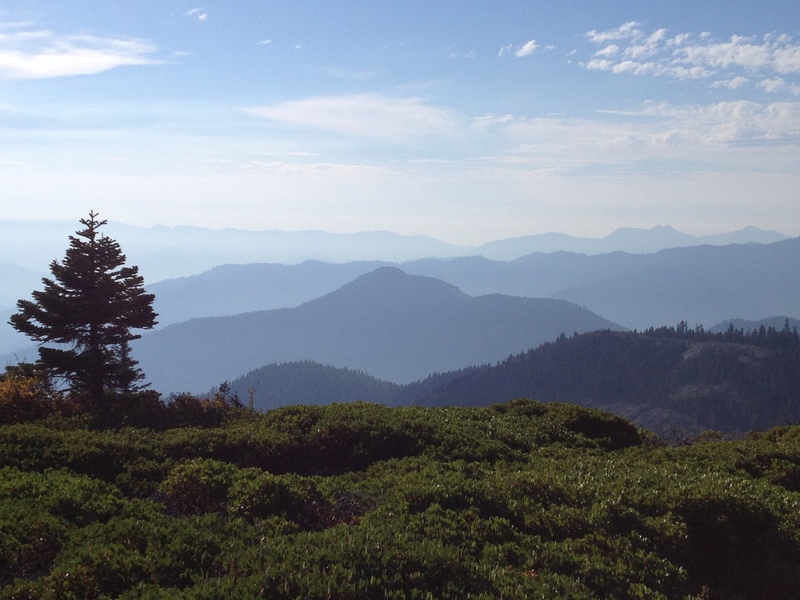 I’d seen glimpses of the view through the trees but now I had an unobstructed panorama as layers of the peaks and ridges of the Siskiyou Mountains receded into the horizon. It was breathtaking. “You are doing great. I’m going to hang out here for a while,” said my sweep as he found himself the perfect rock to sit on, a perch to view the world before him. He was sweeping to Seattle Bar, mile 27 and I never did see him again. I now had 17 miles of downhill to help dig me out of the time sink I was into neck-deep. I didn’t take many pictures. It’s hard to when you are fighting cut offs but I had to take a picture from the top of Grayback Mountain. I passed Henrik, and Dan, a man familiar to me through mutual friends, on my way to O’Brien Creek (mile 13). I was almost bone dry of the two liters of water I had carried. The temperature had been very pleasant at 6am which doesn’t bode well for how hot it was going to get. The trees sheltered me from the direct rays of the sun on the single track up Grayback but it was hot and exposed on the fire roads. The older gentleman at O’Brien Creek who had taken it upon himself to personally see to me was so kind and helpful, a common characteristic of most aid station volunteers. He filled my water bottles, showed me where I could douse my hat, and reminded me not to forget any items I had laid on the table. “Do you want the very last slice of orange?” I took it just because he offered along with a bunch of grapes, the juice from the fruit helping with the dryness in my mouth despite already drinking two liters of fluid. Before he sent me on my way I felt him straighten out the drape of my desert hat which had gotten caught up in the bandana full of ice that I had around my neck. It was a gesture that had nothing to do with making me run faster or alleviating any physical discomfort but a measure of the attention and care, for a moment, that this man held for me – like a father helping his daughter look her very best on the first day of school. I left with Dan, walking with him while I polished off the grapes, then started running trying to follow the shade as much as possible. It was hot but the ice bandana was doing its job, blunting the effects of the heat and making it tolerable. I was finally making good time, methodically clicking off the miles. Steamboat Ranch (mile 21) came and went quickly, my time there spent refilling the ice bandana and topping off my water bottles. I passed another runner on the road, #90 (Brandon from Alaska) as I made my way toward Seattle Bar (mile 27) which was my first chance to see Alina and Jen. I was very excited to see them and talk to friends after essentially being alone for most of the race. I was happily running down the road when a car pulled up next to me. “You missed the turn,” said the man in the passenger seat. “What?” I could have sworn I’d seen a course marker leading me here and that I was still in the right spot. I got into the car. When he pointed out the turn I couldn’t believe I missed it since it was pretty obvious. I got out and started back on the trail. I got into a freaking car. The words kept repeating in my head. 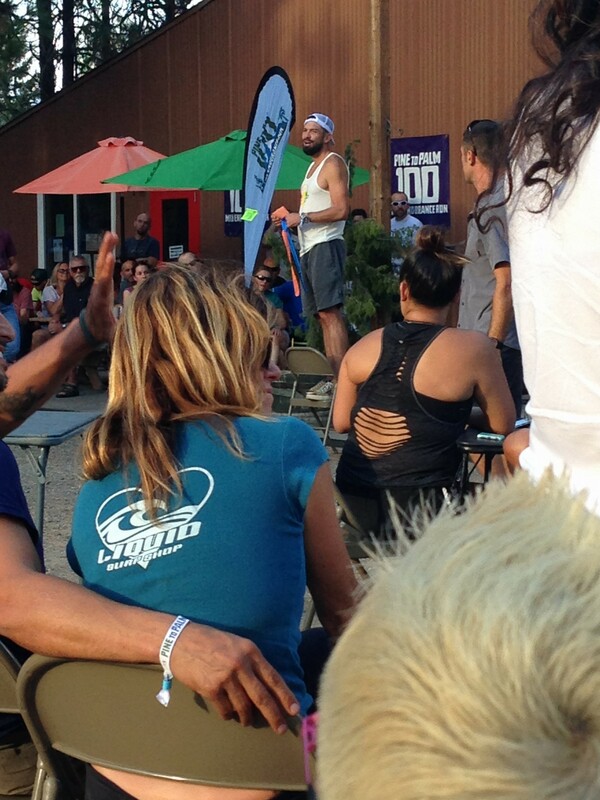 I thought about Magda taking a wrong turn at Western States and digging herself out of that situation to win. She didn’t get into a car. Going off course is the nature of the beast in trail races. It happens all the time. I’d hold the same standard to someone who wins races as the person who finishes dead last. Why, why, why did I get into that car? I berated myself for my profound lack of good judgement. I felt terrible. If I finished this race it would forever feel tainted to me. I knew what I needed to do and the consequences were disheartening. As Seattle Bar came into view, I saw Alina and Jen running excitedly toward me. The happy reunion I had imagined was not going to happen. Jen reached me first ready to help me just like we’d practiced but I shook her off. “I need to DQ myself,” I said and walked past her to the first official looking person I saw, one of the volunteers doing the weigh-in, but he directed me to a man in a black t-shirt who I assume was the aid station captain. I blurted out what happened. Hearing the words said out loud devastated me and it was difficult not to completely lose what tenuous control I had over my tears. “So you actually ran further?” he asked me. “Yes, but I got into a car,” I emphasized as I angrily wiped at my eyes. They were letting me continue. I can’t describe the relief I felt as Jen and Alina went to work on me. I could get back to thinking about the race and get off the emotional roller coaster I’d been on since I got out of the car. I knew I had a tough climb ahead of me to get to Stein Butte and I needed to refocus on what I was doing. That’s when I finally got a good look at the t-shirts they were wearing. 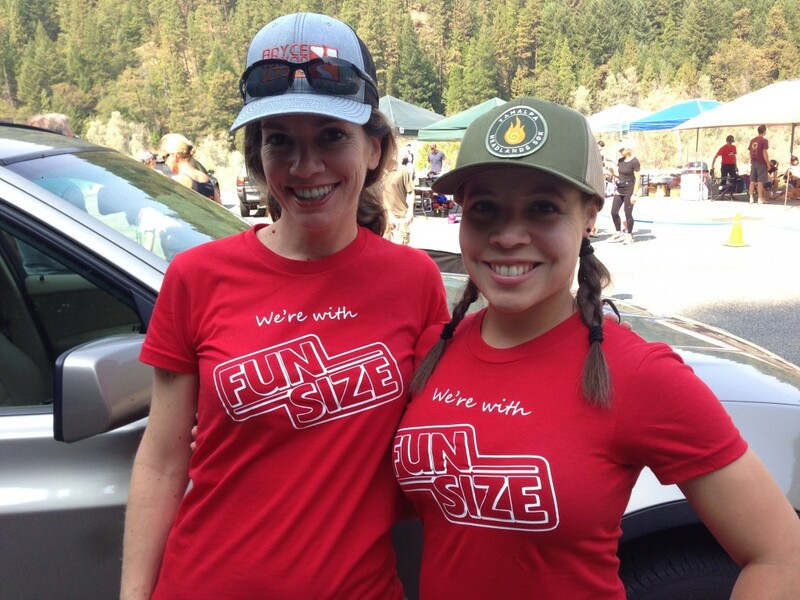 When I had first seen them running towards me I noticed they were in matching red shirts but I was too concerned about my impending DQ to see any other details but now I saw the words “We’re with Fun Size” printed on them. “Your shirts, I can’t believe it!” It was already a huge lift to have them supporting me but to see that they had gone through the effort of getting shirts made with my nickname on it was entirely unexpected. I wanted to do right by my friends and have them be proud of me. I was grateful for the opportunity to keep going and be able to do so. When I went to get my ice water dousing I saw an unexpected friend. “Loren!” He had been great with me at the Kennedy aid station during the Quicksilver 100k that I had done back in May, so helpful and full of positive energy. “I’ve been here awhile resurrecting from the dead.” A moment later he left. “Go follow that guy,” were the parting words I was given and I was on my way again. “We love you!” Jen and Alina’s voices carried to me as I crossed the field. I missed them already. “I love you guys!” I looked back at them one more time, red shirts moving briskly around the parking lot, before I rounded a corner out of sight, alone once more. I heard a lot about the 7 mile climb to Stein Butte (mile 34) but hearing and reading about it did nothing to prepare me for how hard it actually was. On the typical hills in Marin I can muster a 20 minute per mile power hike but on this climb, on this day, all I could get out of my legs was a 30 minute pace. It reminded me in some sections of the steeper, rougher parts of Mt. Tam and Diablo only longer. Brandon passed me at some point. The climb was crushing me. I had left Seattle Bar right at the 2pm cut off with 4.5 hours to make the next cut off 15 miles away at Squaw Lakes (mile 42). It didn’t take rocket science to figure out that I wasn’t going to make it but I kept telling myself if you are on your feet you can still keep fighting. Don’t give up. Get to Stein Butte then figure out what happens next. Not quite to the top of Stein Butte but the grade had eased up momentarily and I could take in the view. Only the second picture I took all day. I heard something behind me and when I turned I glimpsed a man through the trees nonchalantly looking in the other direction. I had to laugh at that. It was the sweep trying to be discrete. I had a shadow again, only this time it didn’t unnerve me. It felt inevitable. About half a mile away from the aid station I saw a runner lying on the ground. When he saw me, he got up and started moving. “Are you asleep?” I asked. It was a stupid question, one of those things when the moment it comes out of your mouth you wish you could take back. I finally spotted the top of a blue awning that told me I had arrived and I saw both Henrik and Brandon seated beneath it neither of them looking like they were moving anytime soon. I had 1 hour and 20 minutes to meet the 6:30pm cut off. If it was a flat road or downhill all the way maybe I could make the 7-8 miles (5-6 to Squaw Lakes then the 2 mile circumnavigation of the lake itself back to the aid station) but I still had a 2+ mile climb ahead before I hit any downhill. This was the end. The sweep, Tyler, came in and gathered some food to bring to Michael, the runner who had stood up when I approached him. When he got to the aid station, Michael was again laid out on the ground. Meanwhile the aid station captain was on the ham radio trying to sort the logistics of getting 4 runners off the butte when he only had a pick up truck that was already packed to the gills with aid station gear and supplies. When it became clear that the only option by vehicle was to abandon our crews waiting for us at Squaw Lakes and be brought to the finish line in Ashland, none of us wanted to do that. Michael, who had apparently been listening to the ongoing conversation, got to his feet, grabbed some food off the table and marched out – resurrection personified. We all followed him. I passed Michael and told him how amazing it was to see him come back from the dead. It was strange making my way to Squaw Lakes, knowing there was no real point to the running I was doing other than getting myself back to Alina and Jen. I wondered when they would realize I was going to get pulled and how they would feel. It was easier to think about them than to dwell on my own thoughts and feelings. I couldn’t go there yet. The race staff were going to let our crews know that we were coming in from Stein Butte but it was still unsettling to come off the trail into a parking lot and not see the car. The aid station itself was a short distance further but I still couldn’t see them. A woman approached and greeted me, offering anything they still had available. Nothing really needed to be said about what was going to happen next. I knew she wanted to help me and make me comfortable. “Are you needing anything else?” she asked as I scanned around the area looking for Jen and Alina in their red shirts. “Yes,” I replied, the use of my nickname surprising me. “Ka-kaw!” I shouted out the goofy call signal that’s an inside joke among some of my friends, hoping they would hear it. The woman’s smile grew even wider. 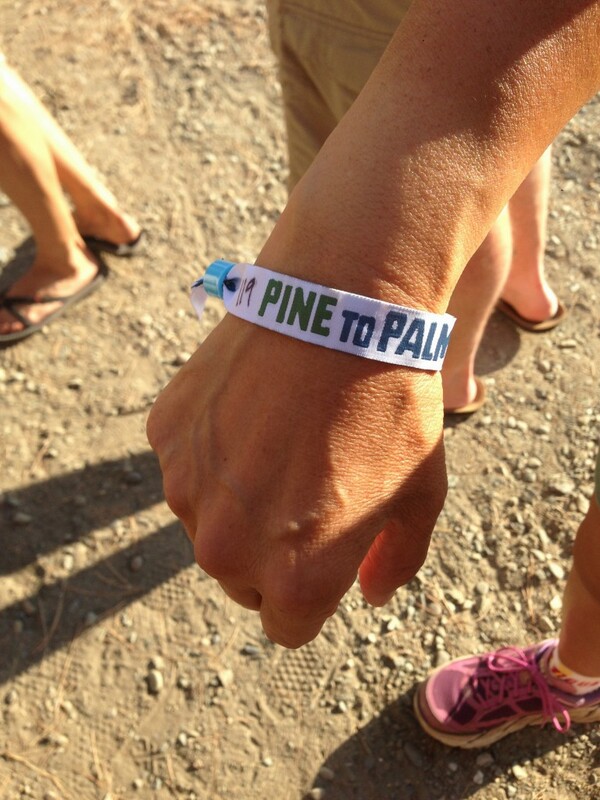 The bracelet put on your wrist at packet pickup and cut by the aid station people when you drop. It’s an awkward moment. What do you say? What do they say? I was just glad to see them and I knew they would be ready to listen when I was ready to talk. Cutting the Pine to Palm bracelet off my wrist was the last step. There’s a finality to seeing and hearing the scissors cut through the cloth ribbon that I’d not felt before. I knew this one was going to hurt but didn’t want to feel any of that now. I talked to Loren and his wife Elisa. I saw Brandon come in, then Henrik. I saw a woman and a little girl running toward Michael, joy and relief clear in their body language. Jen and Alina took me to where my gear was laid out, ready for use to tackle the next section of the course, but now no longer needed. Emotionally I was numb, physically I felt sick. Now that I had stopped moving my body was trying to find a new equilibrium that didn’t involve fighting for time. But I know how this goes. Eat a bit, let things settle, and I’d be okay. 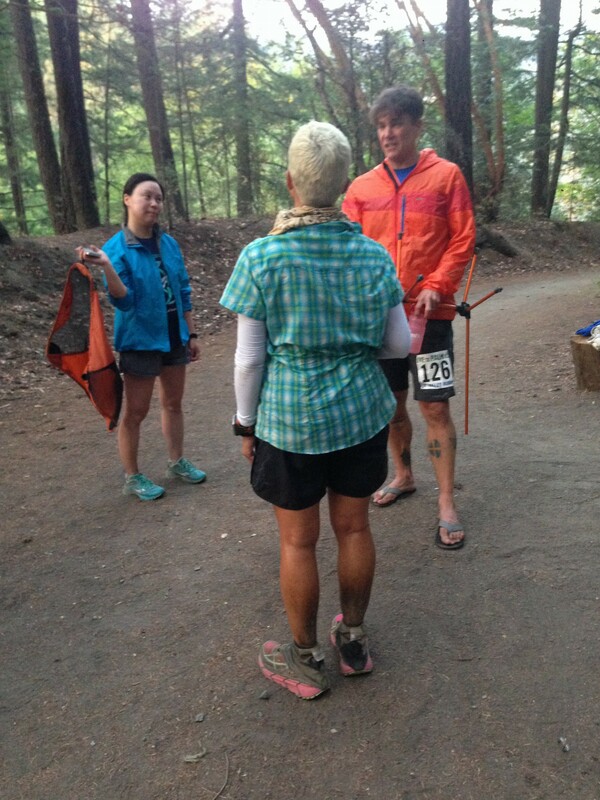 I thanked the aid station crew before I began the short but slow journey up to the car. The same woman who had taken care of me earlier walked out to me with the same warm, caring smile with one last query if I needed anything and making a point to say good-bye. She was nice. Everybody was so nice. Am I just collecting experiences? If that’s the case then the outcome wouldn’t matter but that doesn’t explain how upset I was offering myself up for a DQ or the moments I broke down in tears as I processed the race with Jen and Alina the next day. I wanted this badly. I went in trained, fit, and uninjured. I managed the heat, and was able to continue to take in fluids and nutrition. I had no issues with blisters, chafing or my stomach. Mentally I stayed focused, determined to do the right thing at Seattle Bar come what may, and pushing myself up Stein Butte even as I saw the race slipping away. At the race briefing the night before, Hal Koerner, the Race Director, said that people had expressed concerns over the front loaded nature of the cut offs (they weren’t equally spaced across the 34 hour time limit) but his response was – that’s just the way it is. My overall pace when I got pulled would have had me finish well within those 34 hours but it’s Hal’s race and Hal’s rules. I accept that. I just couldn’t move fast enough to meet those early cut offs and that’s just the way it is as well. I’d love to hear the reasons for those front-loaded cutoffs – I know so many people that have missed them so early in the race. Thanks for writing this up – I know it couldn’t have been easy and how different it is from what you had expected to write. Being trailed by a sweeper is a huge mental challenge (I had that at my first Way Too Cool), but while not even a third of the way through the race? That just seems like a lot of unnecessary pressure that would push a runner to go faster than they should, and hasten their demise. This is a very tough race – congrats on getting as far as you did! And those shirts – they are awesome! I’m guessing it has something to do with permitting? If I ever want to do this race again it’s definitely something I’m going to have to contend with. Those shirts were awesome is right. What a moment when I realized what was printed on them. It was great! Tremendous effort and great write-up. There are no failures in life; there are only learning experiences, right?